Crystal Acoustics Bluetooth Boomer is go-anywhere speaker | What Hi-Fi? 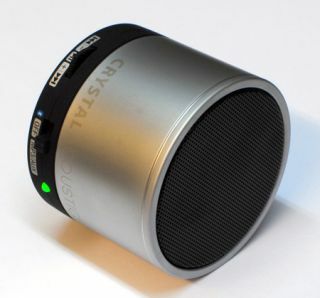 Crystal Acoustics has developed this, the £55 Boomer portable Bluetooth speaker for taking on your travels. It measures 6x5cm and weighs 220g. The device has a satin metal enclosure, top-mounted metal speaker grille and includes a micro-SD card slot for playing MP3 files stored on them. With a built-in microphone and hands-free operation, the Boomer is also a fully functioning speakerphone. Its Surface Bass Boost technology uses the surface the product is sitting on to amplify the bass performance, and a high volume distortion limiter (HVDL) helps reduce distortion at higher volumes.